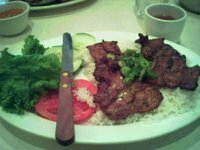 For my last Viet meal in Virginia, my dad yesterday took me to Huong Que, one of the most popular restaurants in the D.C. area which happens to be owned by a guy who went to junior high with my mom in Vietnam. 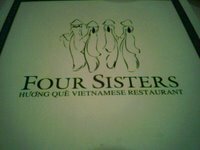 Though the restaurant's Viet name can be translated as "home fragrance," most Americans know it by its Anglo moniker: Four Sisters, which was in tribute to the four daughters in the family. I'm not sure how many know that there are only three sisters working in the family business now, as The Washington City Paper has reported. 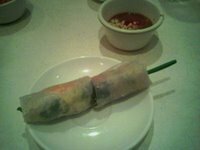 My $6.25 lunch special started with a spring roll, wrapped the traditional way with the green onion strand sticking out of one end. The lemongrass-marinated chicken was so tender that I didn't even need my serrated knife to cut it. My dad ordered the Viet coffee. 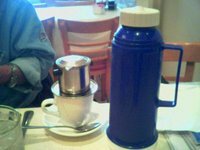 Just as they do in Vietnam, the server brought a thermos of hot water for my dad to pour into the filter himself. 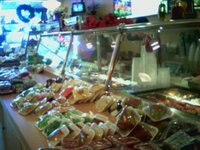 After lunch, we went next door to Song Que, the deli that is also run by the Lai-Tran family. I bought sweet porridge speckled with black beans and the coconut milk on the side, sticky red rice with fresh grated coconut and sticky rice steamed with peanuts to eat on the train ride to New York. I had already stuffed my tote with a papaya and Asian pears for the trip. I'm turning into my mother! Next thing you know, I'll be carrying bags of dried shrimp to Los Angeles. 0 Response to "The Last Viet Meal"